Netflix has begun putting the cast together for its adaptation of Mark Millar and Frank Quitely’s Jupiter’s Legacy. According to Collider, Josh Duhamel and Leslie Bibb have been tapped to lead the series as The Utopian and Lady Liberty, respectively. 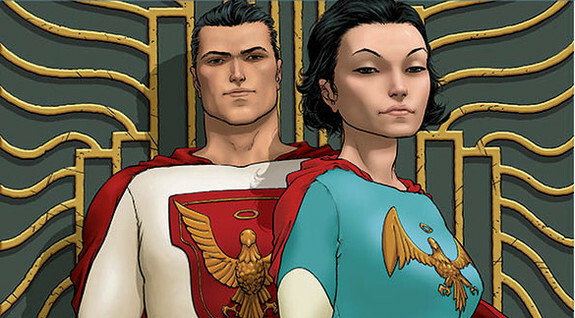 Millar and Quitely began publishing Jupiter’s Legacy in 2013. In the series, The Utopian and Lady Liberty are the costumed aliases of Sheldon and Grace Sampson. After venturing to a mysterious island with a handful of their friends in 1932, they gained superhuman abilities and established themselves as the first generation of superheroes. They soon formed the Union of Justice. Years later, Sheldon and Grace had two children, Chloe and Brandon, who inherited their own set of powers. However, Chloe and Brandon also developed a cynical attitude toward superheroes and struggled to find their places in the shadow of their famous parents. Andrew Horton will co-star as Brandon, who operates under the name Paragon. Unfortunately, he isn’t purely altruistic. Instead, he uses his superhero status to achieve lucrative endorsement deals. Elena Kampouris plays Chloe, a troubled model with a fondness for drugs and the nightclub scene. Other cast members include Ben Daniels as Sheldon’s psychic brother Walter, a.k.a. Brainwave, and Matt Lanter as Sheldon’s best friend George Hutchence / Skyfox. Both characters were founding members of the Union of Justice. Steven S. DeKnight, best known for showrunning Daredevil’s inaugural season, will assume the same role for Jupiter’s Legacy. DeKnight will also write and direct the pilot episode. Additionally, DeKnight will executive produce the series alongside Millar, Lorenzo Di Bonaventura, and Dan McDermott.